PASIR GUDANG: Seri Alam Properties Sdn Bhd, a wholly-owned subsidiary of UMLand Bhd, will launch its high-end residential properties at Bandar Seri Alam starting next year. General manager Mohd Noor Abdul Salam said the company would allocate 202.34ha at the ongoing township project for the high-end homes. He said the properties would include double-storey cluster and semi-detached houses and bungalows priced from RM450,000. “The demand for high-end properties in Johor Baru is on the uptrend, especially with Iskandar Malaysia progressing well,’’ he said. Noor was speaking to StarBiz at the launch of the company’s double-storey link houses, Bluebell @ Garden Residency, by Johor Jaya state assemblyman Tan Cher Puk recently. 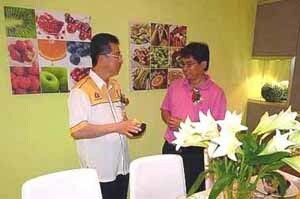 Pasir Gudang is one of the five flagship development zones under the Eastern Gate Development of Iskandar. Other zones are Johor Baru City Centre, Nusajaya, Western Gate Development and Senai-Skudai. Noor said the entry-level prices for high-end properties in Pasir Gudang were still much lower compared with those in Nusajaya. “There are many ongoing and planned infrastructure projects for Pasir Gudang and this will help improve connectivity,’’ he said. The ongoing projects include Coastal Highway linking Pasir Gudang via Permas Jaya second bridge and phase two Senai-Pasir Gudang-Desaru Expressway. In the pipeline are the integrated transport system which will consist of light rail transit lines from Pasir Gudang to Johor Baru and Nusajaya and the extension of mass rapid transit line from Singapore to Pasir Gudang. Noor said the “City of Knowledge” status given by Iskandar Regional Development Authority to Bandar Seri Alam would boost the township’s image. Masterskill University College of Health Sciences Universiti Kuala Lumpur and Universiti Teknologi Mara would set up branch campuses in the township. This is expected to create a student population of 40,000. Bandar Seri Alam covers 1,347.60ha, of which 60% has been developed into 10,000 mixed properties. The remaining 540ha will keep the company busy for the next 10 to 15 years. DNP Holdings Bhd, which has 56 retail outlets carrying high-street labels like Dorothy Perkins and Top Man, plans to add another 20 to 30 similar outlets over the next three years. General manager Lee Kong Beng said the company is likely to stick to the Klang Valley, Penang and Johor for the expansion. "The plan is to expand our existing brands and we may bring in one or two new brands next year," he told Business Times. 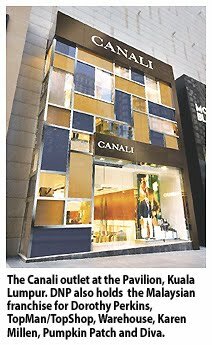 The company, via its retail arm DNP Clothing Sdn Bhd, also holds the Malaysian franchise for other well-known clothing labels like Warehouse, Karen Millen, Pumpkin Patch, Diva and Canali. It is set to open its first "Uniqlo" outlet in Malaysia in November at the Farenheit 88, formerly known as KL Plaza in Kuala Lumpur. DNP's parent, Wing Tai Asia Group, also has other franchises and it may capitalise on that to bring new fashion labels to Malaysia, Lee said. On its property division, DNP's Impiana Commercial Hub in Bukit Mertajam on mainland Penang is set to be launched in September or October. Sprawled over 20 hectares, the commercial development is set to house a Tesco hypermarket, food and beverage outlets, a medical centre, a budget hotel and a dedicated area for electrical and electronics shopping. DNP reported a net profit of RM53.2 million for the year to June 30 2010, which is almost four times what it made in 2009, as it made more money from its property and trading businesses. Its revenue jumped by more than a third to RM354.3 million. 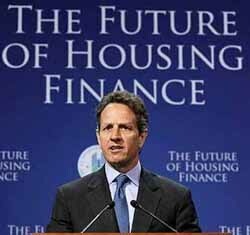 WASHINGTON: The US government’s role in housing finance should undergo “fundamental change,” but it should still provide some guarantees in the mortgage market, said Treasury Secretary Timothy Geithner. Setting the stage for what promises to be a long debate about fixing Fannie Mae and Freddie Mac, Geithner convened a conference of housing industry leaders and heard a range of ideas about reforms for the US$10.7 trillion mortgage market. Almost two years after the government seized Fannie and Freddie to save them from collapse, there is a widely held view that reform is needed, but the agreement ends there. “It’s safe to say there’s no clear consensus yet on how best to design a new system. But this administration will side with those who want fundamental change,” Geithner said. Fannie and Freddie – recipients of US$150bil in taxpayer bailout money since being taken over by the Bush administration in 2008 – pose a vexing policy challenge to the Obama administration as November elections approach. The firms’ pursuit of growth and profits helped precipitate the financial crisis of 2007 to 2009, but their vast resources also helped minimise its impact. And since their takeover, the two have only become more prominent in the market. Together, the two companies and the Federal Housing Administration now back 90% of new US home mortgages. But Geithner backed some government guarantee for mortgages and US support for housing more broadly, setting early limits on the reform discussion. As the administration worked to draft a housing overhaul by January, the key question, Geithner said, would not be whether government has a role to play in supporting the mortgage market and the “American dream” of home ownership. The conference, including some of the mortgage sector’s top lenders and investors, was billed as a “listening session” to help the administration develop its overhaul plan. It comes amid signs of persistent weakness in housing markets – an issue that could weigh on voters headed to the polls in November, especially in Florida and California. Housing starts nationwide rose in July from a downwardly revised level in June, but the pace of new construction was much weaker than forecast and permits for future building fell to their lowest level in more than a year, according to a US Commerce Department report on Tuesday. A Deutsche Bank study looked at mortgage delinquency rates in the country’s 435 congressional districts, all of which are up for grabs in November. More than 15% of mortgages were delinquent by 90 days or more in 60 of those districts, with Florida and California accounting for 44 of them. The average US congressional district had more than 9% of its mortgages delinquent by 90 days or more – over two and a half times the delinquency rate on Election Day in 2008. The US economy was approaching a “cul-de-sac” unless a positive fiscal stimulus came soon, he said.